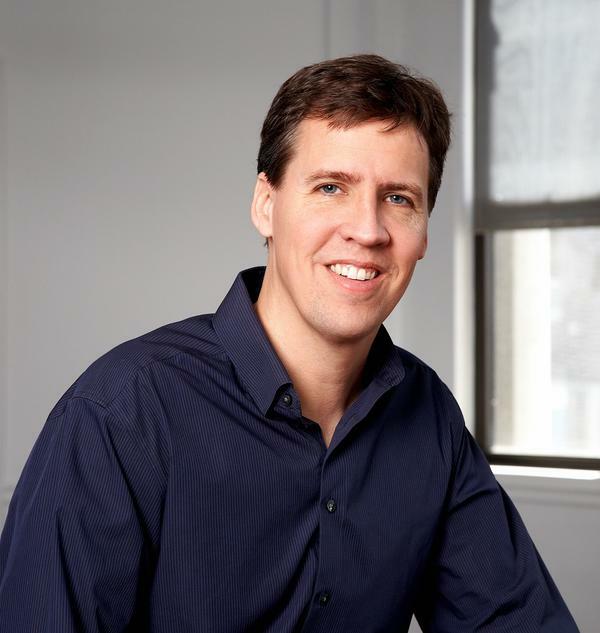 Jeff Kinney is an author, cartoonist and game designer. He lives in southern Massachusetts and has two sons. We've chosen some popular books for our monthly Backseat Book Club selections, but nothing quite like the boffo best-sellers in the Diary of a Wimpy Kid series. How popular are these books? Consider the numbers: There are six books, and a seventh is on the way. They've been translated into 40 languages and there are 75 million copies in print worldwide. And it was our 2009 interview with author Jeff Kinney that originally inspired us to start a book club just for kids. In the publishing world, Kinney is a rock star, and when the students at Murch elementary in Washington, D.C., got to meet him up close, the screaming almost matched Shea Stadium during a Beatles concert. The wimpy kid of the title is Greg Heffley, who works hard to fit in and be cool at his middle school. With jeans, tennis shoes and a broad, toothy smile, author Jeff Kinney looks a bit like a big kid himself, and he told the students he felt a lot like his hero when he was younger. "I think I felt a lot like Greg Heffley as a kid. You know, I did a lot of the same sorts of things that Greg did and I wasn't always the best kid. I was average but I wasn't always the best. I did some things I'm not so proud of." Luckily for Kinney, those mishaps paved the way for a publishing gold mine. The books are small and simple, filled with hangman-style drawings and text that looks as though it's been scribbled by hand with pencil. In fact, Diary of a Wimpy Kid actually looks like some kid's diary, and that's a big part of the appeal. Kids also love the stinky, gross-out humor — like the time that Greg is forced to go to a neighbor's party. His mom tells him he has to be nice and try the deviled eggs — and yuck! He hates them. So he slips the half-eaten deviled egg into his neighbor's potted plant, where it stays for weeks, creating a real stinker of a problem for the neighbors. "They moved away because they couldn't get rid of the smell in their house, right, so they eventually moved, but what they didn't know is that they took the plant with them where the rotten eggs were," Kinney tells the kids. That sort of thing might not be so funny to parents, but it's high comedy for the preteen set. Kids don't just laugh at Greg's antics: Teachers and librarians say the Wimpy Kid books are a big hit because the kids also get to laugh at the absurdities and indignities of middle school life. Because let's face it, no one really wants to be 13 again. Kinney says he never intended to write kid's books. He was an aspiring cartoonist whose work was always rejected because it looked too childish. "I just could not draw like a professional cartoonist," he says. "I was like, 'I draw like a middle-schooler, right?' And eventually this idea came to me ... maybe if I act like I'm doing it on purpose, everybody will think that I was doing it on purpose, and they won't be able to reject me ... that's where the idea of Diary of a Wimpy Kid came from." Talk about failing up — Kinney's books are read around the world, from Japan to Israel to Germany, though in Germany they have a slightly different title: Greg's Journal: I'm Surrounded by Idiots. "I said, 'Why can't we just call it Diary of a Wimpy Kid like we call it in the U.S.?' And they said, 'Well, that's because there is no word for 'wimp' in Germany.' So I thought that that was pretty funny," he says. Kinney says he tries hard to stay grounded, despite the international success, the best-seller list, the two movies (with more of both on the way), the books about the making of the movies, plus the pajamas and lunchboxes and all that swag. As sweet as it is, success can also be a trap. We wondered if Kinney still has the freedom to experiment and take risks, when his publishers are counting on constant home runs? "I think that what what happens with a creative property, whether it be a comic strip or a book series or a television sitcom, is that the stakes keep getting higher, and I think eventually that gets out of control," Kinney says. "What I try to do is I actively try to repeat myself, in a way — it's because I don't want you to be able to detect a difference between the first book and the latest." Happy summer to all our Backseat Book Club readers! Read early and often, and don't forget to send us your suggestions for the fall. And I'm Audie Cornish. It's time now for NPR's Backseat Book Club. This month, our young readers helped us choose the book. It is "Diary of a Wimpy Kid" by Jeff Kinney. It was clear how popular that choice was when the author visited Murch Elementary School in Washington, D.C. He spoke with a group of very excited second, third and fourth grade students. Our own Michele Norris was there. MICHELE NORRIS, BYLINE: We have chosen some popular books for our monthly Backseat Book Club selections, but nothing quite like the boffo best sellers in the "Wimpy Kid" franchise. How popular are these books? Well, consider the numbers. There are six books, a seventh is on the way. They've been translated into 40 languages and there are 75 million copies in print worldwide. Author Jeff Kinney is a rock star in the publishing world and, for students at Murch Elementary in Washington, D.C., to meet him up close - well, it's almost like seeing The Beatles backstage at Shea Stadium. UNIDENTIFIED WOMAN 1: Can I touch you? NORRIS: All right. That may be a bit of an overstatement. Kinney is not exactly Paul McCartney, but the kids here are stoked. Most have burned through all of Kinney's "Wimpy Kid" books. 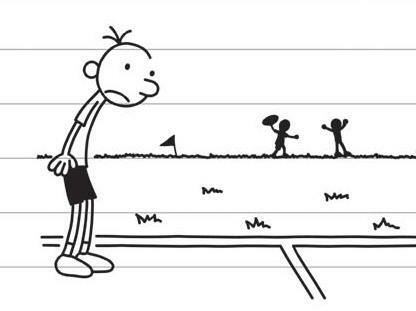 The kid in the title is Greg Heffley, who's working so hard to fit in and be cool in middle school. With jeans, tennis shoes and a broad, toothy smile, Jeff Kinney looks a bit like a big kid himself and there's a question every student here wants to ask. AYASALEM: My name's Ayasalem(ph) and - well, you said that you sometimes acted and, like, were Greg Heffley when you were a kid, but did you ever feel like Greg Heffley when you were a kid? JEFF KINNEY: I felt a lot like Greg Heffley as a kid. You know, I did a lot of the same sorts of things that Greg did and I wasn't always the best kid. You know, I was average, but I wasn't always the best. I did some things I'm not so proud of. NORRIS: Those mishaps paved the way for a publishing goldmine. The "Wimpy Kid" books are small and simple, filled with hangman-style drawings and text that looks as if it's been scribbled by hand with pencil. "Diary of a Wimpy Kid" actually looks like some kid's diary. That is part of the appeal. Kids also love the stinky, gross-out humor, like the time in book five where Greg is forced to go to a neighbor's party. His mom tells him he has to be nice and try the deviled eggs. Bleck. He hates them, so he slips a half-eaten deviled egg in his neighbor's plastic potted plant and it stays there for weeks, creating a real stinker of a problem for those neighbors. UNIDENTIFIED MAN: He put, like, rotten eggs in his plant. UNIDENTIFIED MAN: Whatever happened to them? KINNEY: They moved away because they couldn't get rid of the smell in their house, right? And so they eventually moved, but what they didn't know is they took the plant with them where the rotten eggs were. NORRIS: Kids also like the fact that the book is filled with a kind of bawdy, close to the edge humor that their parents might not applaud. UNIDENTIFIED MAN: His brother - what's his name, Rodrick - had that, like, secret party when their parents weren't there. Did your brother ever do that? KINNEY: I don't think my older brother ever had a secret party, by my younger brother did and he got busted. Do you know how? He actually left a Fisher Price character, a little action figure, in the hot tub. Isn't that funny? NORRIS: Maybe not funny to parents, but it's hilarious for kids. And they don't just laugh at Greg Heffley's antics. Teachers and librarians say the "Wimpy Kid" books are a big hit because the kids also get to laugh at the absurdities and indignities of middle school life because, let's face it, no one really wants to be 13 again. Kinney never intended to write kids' books. He was an aspiring cartoonist whose work was always rejected because it looked too childish. KINNEY: And it was because I just couldn't draw like a professional cartoonist. I knew what I was drawing was not the same as what was in the papers and so I worked at it and worked at it, but I just couldn't get better. I was like, I draw like a middle schooler, right? And, eventually, this idea came to me. I said, well, if I draw like a middle schooler, maybe if I act like I'm doing it on purpose, everybody will think I was doing it on purpose and they won't be able to reject me because I'm not a very good cartoonist. So that's where the idea for "Diary of a Wimpy Kid" came from was this failure. NORRIS: Talk about failing up, as he shows the students his favorite international covers, Kinney is almost bemused that his books are read around the world, from Japan to Israel to Germany. KINNEY: Greg's (foreign language spoken), which means Greg's journal, I'm surrounded by idiots, which I think is a funnier title than my own title. But I said, why can't we just call it "Diary of a Wimpy Kid" like we call it in the U.S.? And they said, well, that's because there is no word for wimp in Germany, so I thought that that was pretty funny. So I'll show you another one. I like this. This is the Brazilian version and it's called (foreign language spoken), right? I said to my publisher there - I said, well, what does banana mean in your country? And they said, it means banana. NORRIS: I guess banana has special appeal. Sorry, my inner Greg Heffley is coming out. Well, it was delightful to watch the kids examine the superstar author in their midst, whispering to each other about his tennis shoes or the fact that he carries a backpack, too. Kinney says he tries hard to stay grounded. The best seller list, the two movies, the books about the making of the movies, the pajamas, the lunchboxes, all that swag - as sweet as it is, success can also be a trap. And we wondered if Kinney still has the freedom to experiment and take risks when his publishers are counting on constant home runs. KINNEY: I think that what happens with a creative property, whether it be a comic strip or a book series or a television sitcom is that the stakes keep getting higher. And I think, eventually, that gets out of control. And so what I try to do is I actively try to repeat myself in a way. It's because I don't you to be able to detect a difference between the first book and the latest. NORRIS: So you're more than an author and an illustrator. You have to have a strong business sense, at some point? KINNEY: Unfortunately, I think the reality is that you become a property holder and you have to think of things more broadly. And I often marvel at the fact that, you know, I started off as somebody who just wanted to write a book and now that's the thing I have the time for the least. Everything else gets in front of that, so it's very difficult to find the time to do what got this started in the first place. NORRIS: Do you have a number in mind - like after book number 12, I'm moving on to something else? KINNEY: I don't know what the answer is to that because I feel like I had this dream of becoming a cartoonist and then, all of a sudden, I'm five years in and I've got, you know, seven books and it feels like, in some ways, that's enough. And, in others, I feel like I'm just getting started. NORRIS: Jeff Kinney, author of "The Diary of a Wimpy Kid" series. One more thing you might want to know about Kinney. He's also a blockbuster success in his day job. He's the mind behind the popular online game, Poptropica. Ask your kids. They'll know about it. Happy Summer to all our Backseat Book Club readers. Read early and often and don't forget to send us your suggestions for the fall. We'll be back in the backseat in September. Michele Norris, NPR News. Transcript provided by NPR, Copyright NPR.